Those fishing the Ramsey AS Christmas open match on the Old Nene at Ramsey St Mary’s saw some huge nets recorded. Top rod with a superb 32lb 14oz net of quality rudd topped up with roach and skimmers was Malcolm Hobbs. He drew the bridge peg on the Mill side of the drain and caught on the whip with hempseed. 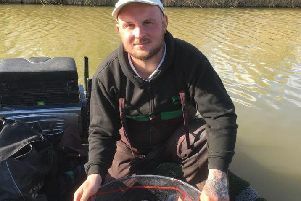 Runner-up was Paul Kilby, who put 29lb 3½oz to the scales. Then came Keith Rayment on a level 15lb taken on red maggot. A few new faces joined regulars on the second Deeping St James club day on the River Welland match stretch on Roadside in Deeping St James. With the river lower than normal and the colour dropping out it soon became apparent that the low numbers were the pegs to be on. Winning his first club match and also collecting the club cup was Nigel Collis from peg four. He fished a superb match, catching well over 100 small roach for 5lb 11oz on the pole using pinkie and bread punch hook baits. Second was Ray Torrington on peg 26 with 1lb 15oz of small roach and chublets then came Ron Needham on peg 10 with four perch for 1lb 12oz. In the Over 55s match at Float Fish Farm, Danny Carlton took the honours on the Horseshoe Pool with 46lb 4oz. He caught on a small feeder as did runner-up Stan Dow, who weighed in 39lb. In third place fishing the waggler with maggot was Ted Rowe on 17lb 8oz. Webb’s AC fished Horseshoe on Sunday with Alan Marshall finishing out in front on peg 21 catching on a small feeder for 32lb 12oz. Runner-up with 31lb 10oz was Alan Forrest, then came Martin Delegate with 31lb 8oz. Haddon Lodge, Sunday: 1 Lucio Melillo 14lb 4oz; 2 Cliff Fuller 13lb 2oz; 3 Martin Harwood 11lb 5oz. Rookery Waters Open, Magpie Pool: 1 Andy Leathers 75lb 2oz; 2 Mark Pollard 69lb 15oz; 3 Jamie Maguire 56lb 15oz.